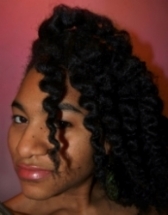 ​I'm looking at natural ingredients to combat dryness in black hair and aid hair to be healthy and grow. Our internal nutrition affects our external hair. A special welcome to 4c ladies and guys (much love to the men who grow their natural hair)! We must have the knowledge that is true to form a true definition of that which we are and are capable of and beyond. This includes the true knowledge of our ancestors' history (way of living, perception and importance of purpose), self soul searching, and conscious physical care of ourselves (diet, hair grooming) to vibrate at our highest frequencies. When I began considering colleges, preparing for the next chapter in my life, I realized that I needed to reach back to uncover and gather the best of my African ancestry, so that I can achieve my full potential as I move forward AND guide others that are ready to do the same. I began my quest with halting all perm use on my hair in 2008. I had been processing my hair, since a neighbor convinced me as a child to begin (a woman with her own identity crisis) I have sought and gained a lot of knowledge (and hair density back) since then. I have discovered how to work with it and not against it. However, it was not until recently that I realized that I NEEDED A HAIR CARE REGIMEN to make it keep growing longer, faster (as fast as it will go). I love using nature’s products including herbs. Join me and find the right balance for your hair too! We must Connect, Cherish, and Embrace our true Creators Essence (Supreme Divinity) expressed through culture that bears wisdom and resources. Cheers to a radiant body, soul, and spirit!